Go for it….Spice up your life! Scientific research has revealed what the people of India have known for centuries! Turmeric and Saffron, whether combined with pharmaceuticals, or taken by themselves, cleanse the skin and cure what ails you; both spices functioning as natures prized antibiotics. Turmeric and its cousin Saffron contain a polyphenol called “curcumin”, an antioxidant that is associated with reducing nutrition related pathologies. They are bland tasting, turmeric has a rich yellow color that we associate with “Curry” and saffron is orange and string-like. These wonderful seasonings are slowly taking on the health importance that they deserve. Studies have determined that “Curcumin” impacts health as an: “antioxidant, anti-inflammatory, antiviral, antibacterial, antifungal, and anticancer activities and thus has a potential against various malignant diseases, diabetes, allergies, arthritis, Alzheimer’s disease, and other chronic illnesses. The positive impact of the medicinal properties are mediated through the regulation of various: transcription factors, growth factors, inflammatory cytokines, protein kinases, and other enzymes”, states The University of Texas MD Anderson Cancer Center. They further attest curcumin to be the “Spice of Life” saying that, “Curcumin exhibits activities similar to recently discovered tumor necrosis factor blockers (e.g., HUMIRA, REMICADE, and ENBREL), a vascular endothelial cell growth factor blocker (e.g., AVASTIN), human epidermal growth factor receptor blockers (e.g., ERBITUX, ERLOTINIB, and GEFTINIB), and a HER2 blocker (e.g., HERCEPTIN).” All evidenced in the country of India which has been duly of having lower occurrences of heart disease and cancer. Many comparisons have shown that individuals who leave India are diagnosed with a health disease, not otherwise documented in previous family history, after moving into a western society. Duly noted, the main difference in dietary intake was a lower to “no” amounts of turmeric being consumed in their meals. Turmeric is not as costly as saffron and is readily available with other herbs and seasonings in stores, or in 300 mg capsule form in the vitamin and mineral grocery isle. Introducing turmeric into meal preparation is very easy to do. 1 teaspoon added to rice, pasta, potato’s, soups and vegetables are good ways to switch from the salt shaker to a healthier spice that heals and makes your body work and function better. Saffron is more costly and commonly used in the Italian dish Risotto Milanese, however, it also provides the same healing benefit as its close relative. With a few grains, turmeric’s antiseptic properties help to heal cuts, wounds, kitchen burns and abrasions. Make a paste of Turmeric and Raw Honey; 1 teaspoon honey and 1 teaspoon turmeric. Adjust amount to wound, apply to wound and cover with a gauze. 3 x’s/day. Gently rub a small dusting of turmeric onto area of face to reduce facial hair growth. Massage into skin with a dampened tea bag. A mixture of 1 teaspoon turmeric and 1/4 cup yogurt rubbed onto the abdomen to reduce stretch marks during pregnancy. Rinse off after 5 minutes. Added 1/4 teaspoon to individual meals through out the day, keeps various diseases a bay. Mixture of 1/4 teaspoon turmeric, 1/8 teaspoon salt and 1/2 teaspoon mustard oil rubbed into gums to combat gum infections. Rinse with warm water. Accredited for reducing anemia and sore throats by eating a paste made of 1 teaspoon raw honey & 1/4 teaspoon of turmeric. 3 x’s/day. Sick with an infection? Combine: glass of milk and stir in 1/2 teaspoon turmeric , 1 teaspoon honey. Drink this natural antibiotic 2 times a day. Medicinal use for pathologies have duly noted an intake of 1-2 teaspoons of turmeric 3x’s a day inhibits growth of tumors, improves function of pancreas, reduces incidence of heart attack. Heal Acne by combining in a bowl 1/2 tsp water, 1/4 tsp turmeric and 1/8 tsp salt. With a cotton ball gently dab a small amount of paste onto acne and allow skin to absorb ingredients overnight. In the morning, gently cleanse to remove and refresh skin. For modern western medicine practices, the excitement around the ancient asian spices brings hope on the horizon for how meal preparation can enhance an individuals overall health. 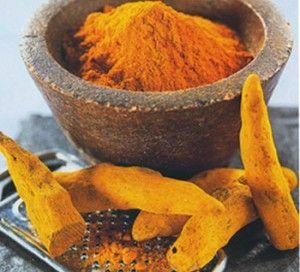 The many benefits of polyphenol curcumin are continuously being researched: Inflammation, Arthritis, Irritated Bowel Syndrome, Kidney Disease etc. Present studies have shown that curcumin inhibits the proliferation of tumor cells in cultures, human and animal studies. Curcumin’s many strengths and limitations are being seriously explored and are bringing new opportunities to healing ones body. 1. Food Chem Toxicol. 2011 Aug;49(8):1834-42. Epub 2011 May 6. Safety Assessment of a Solid Lipid Curcumin Particle Preparation: Acute and Subchronic Toxicity Studies. Dadhaniya P, Patel C, Muchhara J, Bhadja N, Mathuria N, Vachhani K Soni MG.
Pre-Clinical Department, Cadila Pharmaceuticals Ltd., Dholka 387 810, India. 2  .Best Pract Res Clin Gastroenterol. 2011 Aug;25(4-5):519-34. Curcumin: The Potential for Efficacy in Gastrointestinal Diseases. Irving GR, Karmokar A, Berry DP, Brown K, Steward University of Leicester, Department of Cancer Studies, Room 503, Robert Kilpatrick Clinical Sciences Building, Leicester Royal Infirmary, Leicester LE2 7LX, UK. 3. J Fam Pract. 2011 Mar;60(3):155-6. Clinical Inquiry. Does turmeric relieve inflammatory conditions? Oregon Health & Science University, Family Medicine, Portland, USA. Curcumin, the golden spice from Indian saffron, is a chemosensitizer and radiosensitizer for tumors and chemoprotector and radioprotector for normal organs. Department of Internal Medicine, Baylor University Medical Center, Dallas, Texas, USA.